For 26 years, the Government of Sri Lanka fought a deadly war against the Liberation Tigers of Tamil Eelam. In May 2009, Sri Lankan military forces finally declared victory over the Tamil Tigers. The deadly conflict cost the lives of an estimated 80,000-100,000 people including Army soldiers, Tamil fighters and civilians. By 2007, the civil war had displaced more than 460,000 people in the North-East region of Sri Lanka. The final stage of the war alone created an estimated 300,000 internally displaced persons. Although the deadly battle against terrorism has come to an end and that development projects are underway to rebuild the Northeast region, another nightmare has already haunted the Tamil minorities in the Northeast. There is fear among the Tamils about a “Sinhalization” of the Northeast region that was originally home to the Sri Lankan Tamils. The Northeast region is also projected to be negatively affected by natural disasters and other climate change impacts. The dry zone of Sri Lanka, in which the Northeast provinces are located, is projected to become dryer as an increase in temperature and a reduction of rainfall in the Northeast monsoon season are projected by the mid-century. Not only that the direct impacts of climate change could bring negative secondary effects to the people, the ethnic tensions and political unrest in the region could lead to inequitable distribution of aid in midst of a catastrophic natural event, as was observed in the aftermath of the Asian tsunami in 2004. The negative climate change impacts could exacerbate the ethnic tensions in the Northeast region. Country Profile: Sri Lanka [Official Name: The Democratic Socialist Republic of Sri Lanka] is a small island nation in the Indian Ocean. Its nearest neighbor (to the Northwest) is India. The two countries are separated by the Palk Strait that is about 32 kilometers long. 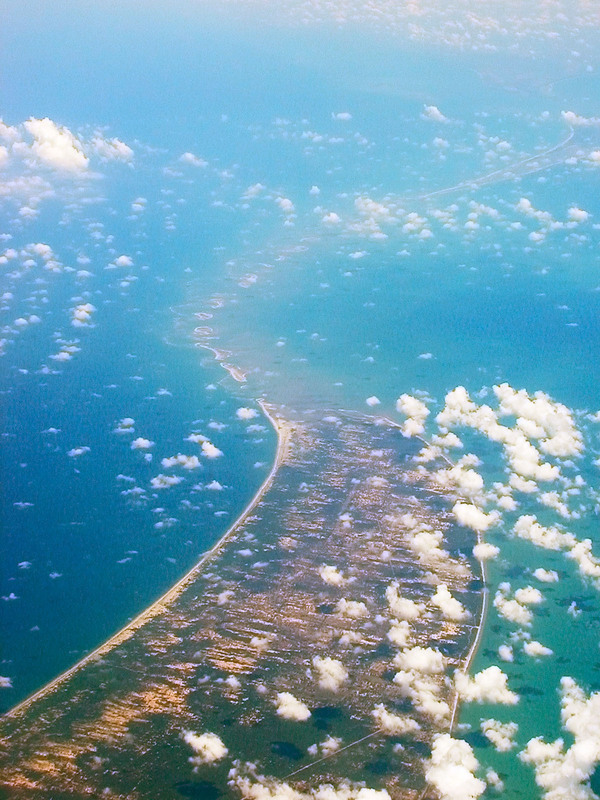 The Palk Strait connects the Mannar Island in Northern Sri Lanka and the village of Dhanushkodi on Rameswaram Island in Tamil Nadu. Sri Lanka is a tropical resort that lies between 6 and 10 Northern latitudes and 80 and 82 East longitudes. The country has a total area of 65,525 Sq. kilometers. The lowest point of the island is the surrounding Indian Ocean and the highest point is the Peak of Piduruthalagala Mountain (2524 meters above sea level). The mean annual temperature is 27 C in the lowlands and 15 C in Nuwara Eliya (highlands). 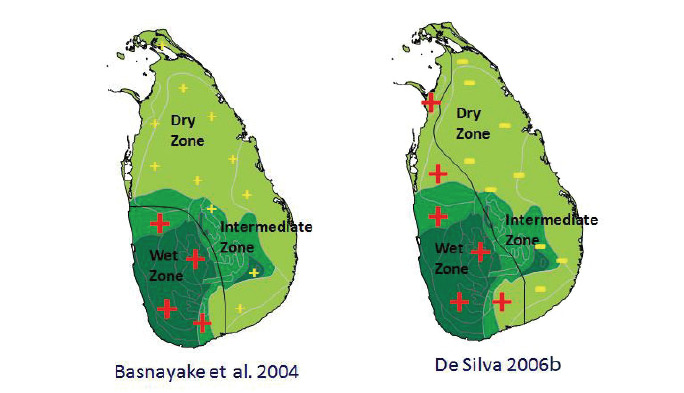 Sri Lanka has three major climate zones: wet, dry and intermediate. Wet zone, comprises the southwestern area and parts of central highlands, receives an average annual rainfall between 2500 and 5000 millimeters (mm). The North-East region in the dry zone receives an average annual rainfall of less than 1750mm and the intermediate zone receives between1750-2500 mm. The overlay images on the Google Earth snapshot demonstrate the two provinces of interest in this case study; North (district borders marked in green), and East (district borders marked in red). Northern Province of Sri Lanka consists of five districts: Jaffna, Killinochchi, Mullaitivu, Vavuniya, and Mannar. Delft Island is one of several islets in northern Sri Lanka. The islet is within the administration boundaries of Jaffna. Mannar Island is within Mannar district administration boundaries. 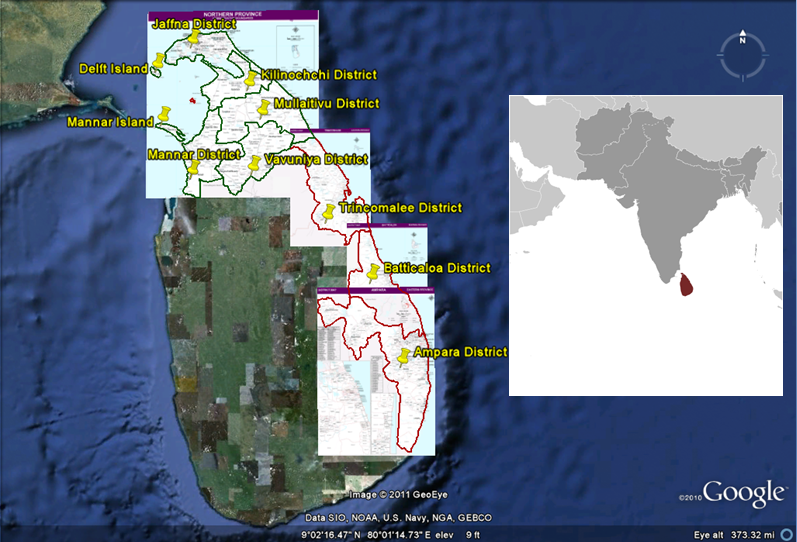 Eastern province consists of three districts: Trincomalee, Batticaloa, and Ampara. The two provinces together consist of 8 of 25 districts in Sri Lanka. The administrative capital of Sri Lanka is Sri Jayawardenapura-Kotte and the business capital is Colombo. The current President of Sri Lanka is Mr. Mahinda Rajapaksa, who is also the Chief of the Sri Lankan Army forces. Until 1972, Sri Lanka was called Ceylon. Other former names of the country include Serendib (by the Arab traders), Sinhadeepa (the island of the Sinhalese people) and Dhammadeepa (the island of the Dhamma). Lanka in Sinhala language means "the resplendent" . The government type of Sri Lanka is republic. There are 9 administrative provinces in Sri Lanka and 25 districts. According to July 2011 estimates, Sri Lanka has a population of 21 million with a growth rate of 0.934% . The majority of ethnic groups are Sinhalese (82%), followed by Sri Lankan Moors (7.9%), Indian Tamil (5.1%) and Sri Lankan Tamil (4.3%) . The majority of the people observe Buddhism (76.7%), followed by Islam (8.5%), Hinduism (7.8%) and Christianity (6.1%) . A History of Climate Change in Sri Lanka: Years ago, the location of Sri Lanka made it a unique destination for the Silk Road traders. Today, its unique location makes the island nation highly vulnerable to climate change impacts. In an interview with the Inter Press Service news agency (2007), the UN expert, Professor Mohan Munasinghe , who is also the vice-chairman of the Intergovernmental Panel on Climate Change, stated that climate change impacts will be worse than what the Sri Lankans experienced during the civil war . Although the scientific community and the government agencies in Sri Lanka work on research projects to assess its vulnerability, susceptibility and adaptation capabilities to climate change , there is very little knowledge about this issue among the general public. That said, the history of Sri Lanka provides evidence that climate change is not a new concept for the country. One historical example is the Adam's bridge, a chain of limestone shoals between Mannar Island in Sri Lanka and the village of Dhanushkodi on Rameswaram Island in Tamil Nadu. The historical story is that Lord Rama and his ape men built and used the bridge to reach Sri Lanka in order to rescue Sita, Rama's wife, who was kidnapped by Ravana, the king of Sri Lanka. This (mythical) story was mentioned in Valmiki's greatest epic, Ramayana . The bridge and the surrounding Sethusamudram sea were marked up on several historical maps. Later, satellite images captured (Figure 3) these natural sand beds that are about 30 km long. While some believe the bridge is a mythical story by Valmiki, some scholars think that the bridge once existed between the two countries, but later was submerged due to a rise in sea level. Another example is the legend of Viharamaha Devi in Sri Lanka as recorded in Mahavamsa, the historical record of Sri Lanka. According to the story, King Kalanitissa (unknowingly) killed a monk. The Gods got upset over this crime and the oceans started to flow into the land. After consulting with his ministers, the King decided that the best and the only way to beg the sea Gods was to set afloat his beautiful and brave daughter, Vihara Devi, in a canoe. The waves brought the canoe to what is today Panama (or Arugam Bay) in the Ampara district. After the Asian tsunami in 2004, scholars found out that there was indeed a tsunami (360BC) in the Indian Ocean around the time which the legend of Viharamaha Devi was recorded. The origin of the civil war in Sri Lanka can be traced back to the British colonization era in Ceylon and the post-independence (Sri Lanka gained independence in 1948) political situation in the country. In 1815, the British invaded the kingdom of Kandy and finally conquered all Ceylon for the first time. The British introduced a new education system, a plantation economy and developed new infrastructure in Ceylon. On one hand, the British education system provided minority groups the opportunity to excel at English and be well-educated. On the other hand; however, the 'divide and rule' policy prevented Tamils from obtaining top jobs in the civil service by the British . Both the Donoughmore and Soulboury commissions were unfair of the minorities to be selected for parliamentary seats . In 1956, the victory of SWRD Bandaranaike, established a platform for a Sinhalization of the country. The same year (June 15), the parliament approved the Sinhalese Language Bill , which intensified the ethnic tensions between the SInhala-majority and the Tamil minority. In 1959, Prime Minister Bandaranaike was assassinated. His widow, Mrs. Sirimavo Bandaranaike, the world's first female prime minister, continued implementing her late husband's sinhalization policies. By the mid 1970s, the unfavorable politics in Colombo made the Tamils called for a separate state in the North-East Sri Lanka. In 1977 elections, the separatist Tamil United Liberation Front (TULF) won all seats in the Tamil-majority region in the northeast . At the same time, violent Tamil rebellion groups, such as the LTTE, intensified the ethnic tensions in the country. The LTTE, by the 1980s, defeated other Tamil separatist groups. Their tactics made the group recognized as a terrorist group in several countries, including Australia, Canada, India and the United States . Figure 4 demonstrates the northeast region of Sri Lanka that was affected by the 26 year long civil war. The area highlighted in red was controlled by the LTTE before may 2009. Figure 5 demonstrates the distribution of ethnic groups in Sri Lanka. The war affected area and the regions occupied by the Tamils are superimposed. Although the civil war officially started in 1983, the root cause of conflict can be traced back to the post-ndependence era when the government of Sri Lanka promoted the "Sinhala Only" act, which eventually led to ethnic conflicts in Sri Lanka. Likewise, even though the civil war officially ended in 2009, tension between the Sinhala majority and the Tamil minority is still unresolved. Climate change projections for Sri Lanka imply negative impacts on the dry zone or Northeast region. Not only climate change impacts can exacerbate the political unrest in the country, ethnic tensions between the two groups can also result in inequitable aid (and relief) distribution in midst of an environmental disaster, as was observed in the aftermath of the Asian tsunami in 2004 and recent flood event from Decmber2010-February 2011. The climate change impacts discussed in this case study are projected for 2050-2100 period. Refer to the map above to locate districts and sub-devisions within the NorthEast provinces. 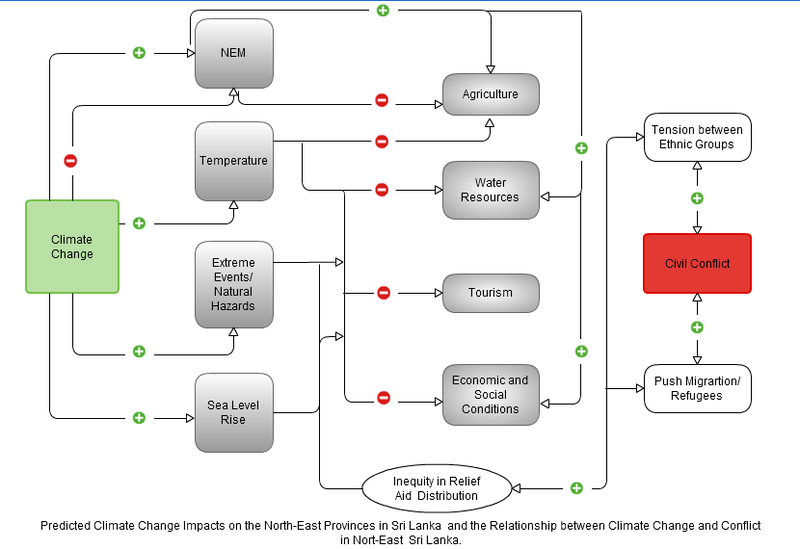 This case study focuses on the projected climate change impacts on Northeast Sri Lanka. Being an island state, Sri Lanka is highly vulnerable to climate change impacts. There are four main predicted impacts on Sri Lanka in general; increasing sea and air temperature, high variability in rainfall, rising seas, and an increase in extreme events or natural hazards. Climate and weather data for Sri Lanka since 1930s suggest a change in temperature and precipitation trends. 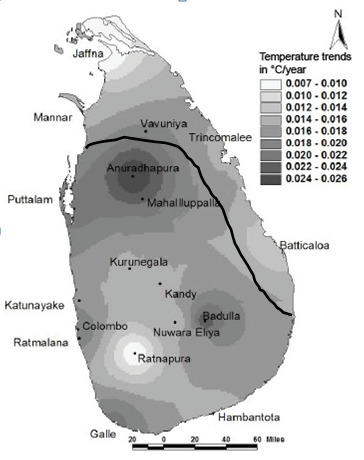 During 1961-1990, Sri Lanka’s mean temperature has increased by 0.016 C . Regional increases of temperature during this period vary from 0.007 to 0.026 C per year . Although there is no significant trend in mean annual precipitation in Sri Lanka, according to estimation made using a Thiesson Polygon Method, mean annual precipitation has decreased by 144 millimeters or 7% during 1961-1990, compared to mean annual precipitation during 1931-1960 . Studies have also found an increase precipitation trend in February and a decrease trend in June . Figure 6 demonstrates observed warming trends in mean annual temperature in Sri Lanka from 1961-1990. Area right of the black line marked on the map is the North-East region. The highest temperature increase is observed in the district of Anuradhapura, the border city between the North and North central provinces. In the Northeast region, higher temperature increase trends are observed in areas to the middle of the country. Coastal area has observed a less increase in temperature. Long term temperature records for Sri Lanka indicate an increase of 0.003 C per year from 1896 to 1996 . The rate of increase in temperature is 0.025 C per year from 1987-1996, indicating a significant warming trend by the end of the 20th century. A report by the International Water Management Institute in Sri Lanka (2010) suggests that the mean temperature in Sri Lanka will rise approximately 0.9 - 4 C (baseline 1961-1990) by 2100 . Sri Lanka is predicted to be increasingly warmer in this century. High warming is projected during the North East Monsoon season, which indicates less rainfall to the Northeast region. The dry zone is projected to be dryer. There have been few studies conducted on future precipitation trends in Sri Lanka, but with contradictory results. The north-east region mainly benefits from the northeast (NEM) or winter monsoon. While some studies project a decrease in NEM, other studies project an increase in NEM, but relatively less in magnitude compared to south west monsoon (SWM). One stu dy (De Silva 2006b) projects a 34% and 26% decrease in NEM by 2050 for A2 and B2 scenarios, respectively . De Silva; however, projects an increase in SWM as well as the mean annual precipitation for Sri Lanka in general. These projections are visually demonstrated in Figure 7. The plus and minus signs indicate an increase or decrease in precipitation, while the size of the signs indicate amplitude in rainfall. Figure 7 indicates that the Northwestern and Southwestern areas in the dry zone are exceptions for De Silva's projection of reduction in rainfall in the dry zone. Another study (Basnayake et al. 2004) suggestS an increase in precipitation during both the NEM and the SWM, but higher increases during the SWM. These changes in precipitation are projected to observe by 2025, 2050, and 2100 for A1F1, A2, and B1 scenarios, respectively. Another study (Ashfaq et al. 2009)  also suggests an increase in rainfall during the SWM in the Western slopes and declined rainfall in the Eastern parts of the country. Small island nations are highly vulnerable to the impacts of sea level rise. In 2007, the UN expert, Professor Munasinghe stated that parts of Jaffna and other northern areas of Sri Lanka will be submerged due to sea level rises . Prof. Munasinghe further stated that Sri Lanka was actually fighting a war over an area "that will soon not be there." According to a research report by the International Water Management Institute, the current rate of sea level rise in Asian coastal areas are 1-3 mm/year, which is "marginally higher than the global rate." . The report also states that the rate of sea level rise in Asia over the 10 year period of 1993-2003 is way greater than that of over the whole 20th century; 3.1 mm/year and 1.7-2.4 mm/year, respectively. The exact rate around which the sea level rise occurs around Sri Lanka is not known. According to the Global Flood Map sea level rise of 18 inches (45.72 centimeters or almost 0.5 meters) could make 47% population in Jaffna homeless. Current elevation of Jaffna is 39 inches and elevation after 18 inches of sea level rise will be 21 inches. The same amout of sea level rise could also make 47% of population in Trincomalee and Batticaloa homeless . The Natural Disaster Hotspots Case Studies by the World Bank states that the most frequent natural hazards that affect Sri Lanka are droughts, floods, landslides, cyclones and vector borne epidemics . Of these hazards, the northeast region has not had any recorded landslides. There have been 1,483 natural disaster fatalities between 1983-2002 in northeast Sri Lanka . Civil war has devastated the region, destroyed its facilities, and weakened the society, which makes the region more vulnerable to natural disasters. This report identifies the Northeast region as a multi-hazard zone that is prone to droughts, floods and cyclones. 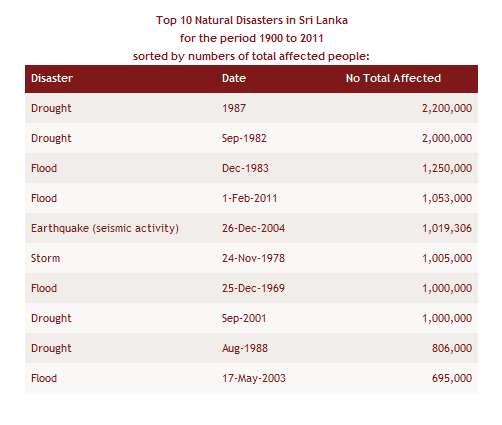 Figure 8 includes a list of top 10 natural disasters - by the number of affected people- for the period 1900-2011. The database lists the 2004 earthquake as the top natural disaster in Sri Lanka in terms of number of people killed (35,399). Figure 9 demonstrates the areas (mostly the northeast Sri Lanka) affected by the 2004 tsunami disaster. The region (already-devastated by the civil war) was also heavily affected by recent floods (December 2010-January 2011), which flooded households and paddy fields, and led to road and school closures. Deforestation is a major environmental problem in the dry zone of Sri Lanka. Population growth, civil war and development projects in post-war Sri Lanka are the main causes of deforestation in North-East region. Prior to 1930s, northern and southern Sri Lanka was geographically separated by a heavy belt of forests north of the city of Anuradhapura . These dense forests formed a natural barricade between the Tamil people in the North and Sinhala people in the South. Although much of the natural area in the North was cleared for agricultural and irrigation needs, the district of Vavuniya is still, relatively, heavily forested, which aided the LTTE guerillas as a hiding place during the war . (b) Place impacted: North-East Sri Lanka, Colombo (The LTTE attacked Colombo several times targeting civilians and government buildings, including the bombing of the Central Bank of Sri Lanka and the Bandaranaike International Airport in 2001). LTTE has been listed as a terrorist group by several countries including Sri Lanka, India, the United States, the European Union, and Canada. During the early stage of war, India, led by then prime minister Rajiv Gandhi, acted as a mediator to resolve conflict in Sri Lanka. The Indian Peace Keeping Force was deployed in Sri Lanka from 1987-1990. Although India was an ally to the LTTE in t he beginning, support to Tamil Tigers dropped after the assassination of former Indian prime minister Rajiv Gandhi in 1991by an LTTE suicide bomber. Norway played mediator in the third stage of Sri Lanka's civil war. In the aftermath of conflict in 2009, many humanitarian organizations, such as the UN, Amnesty International and the Minority Rights Group International have expressed concerns about human rights violations by both the LTTE and the GOSL. Civil: The origins of the civil war in Sri Lanka can be traced back to ethnic-religious disputes between the Sinhala majority and Tamil minority since Sri Lanka's independence from the British in 1948. Figure 10: Snapshot from BBC News video. 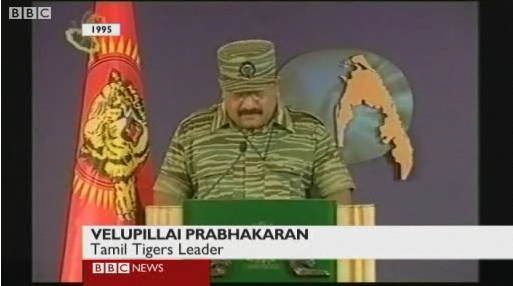 LTTE leader, Velupillai Prabhakaran, speaking in 1995. In the video, the LTTE leader states that unless the new government would come up with a reasonable political framework that meets the need of his people, the LTTE would intensify their struggle. In the background is a map of Sri Lanka with regions of Northwest and Northeast (or Eelam) cliamied by the LTTE highlighted. High - The deadly conflict cost the lives of an estimated 80,000-100,000  people including Army soldiers, Tamil fighters and civilians. By 2007, the civil war had displaced more than 460,000 people  in the North-East region of Sri Lanka. The final stage of the war alone created an estimated 300,000 internally displaced persons .The civil war-that lasted for 26 years between the Sri Lankan armed forces and the separatist LTTE can be divided into four phases. Below is a summary of duration of each phase and the political situation in Colombo, assassinations, massacres, and peace talks that occurred during each phase of war. The civil war officially began in 1983 after an LTTE attack in Jaffna that killed 13 Sri Lankan army soldiers . Soon after the attack, the GOSL flew the soldiers’ bodies to Colombo and called for a mass funeral service to honor the soldiers. This gathering erupted into an anti-Tamil riot in Colombo, commonly known as BlackJuly. Meanwhile, there were violent conflicts among the Tamil separatist groups in the North as well. The LTTE, led by Vellupillai Prabhakaran, successfully defeated other Tamil revolutionary groups such as the Liberation Organization of Tamil Eelam, People's Revolutionary Liberation Front and the Tamil Eelam Liberation Organization, etc. The LTTE used new technologies developed in the 70s and 80s to develop military style organization within the group, and to communicate and coordinate with Tamils throughout the world for financial and military support. In 1987, the GOSL had almost defeated the LTTE in Jaffna peninsula when the Indian government successfully completed operation Poomalai that provided supplies to relief the LTTE . Mr. J.R. Jayawardene was the president of Sri Lanka during this period. He was criticized after the Black July incident for failing to control security forces. The president did not appear in public immediately after the event. President Jayawardene blamed the Tamil separatists for their violence against Sinhalese . After the successful intervention by the Indian government in 1987, President Jayawardane signed the Indo-Lanka accord. Black July: The rampage started in Colombo in July 1983 soon spread into other Sinhala-majority regions. The Sinhala civilians harassed the Tamils by intimidation, looting, arson and murder . Although the government announced an emergency curfew in Colombo, the law enforcement personnel were unable to stop the riots. The other side of this story ; however, is that the policemen did nothing to stop the mobs, instead just stood there and watched as Tamils were harassed, killed, and their properties burnt down to the ground . The official death toll was 367; although, unofficial estimates suggest a death toll around 3,000. The incident created 135,000 Tamil refugees; 30,000 migrated to Tamil Nadu . A peace talk was negotiated by the Indian government. The Indian Peace Keeping Forces (IPKF) was deployed in Sri Lanka from 1987-1990. The first three years of this period was controlled by the Indian Peace Keeping Force. The deployment of the IPKF was following the Indo-Sri Lanka accord in 1987. Although the original intention of deploying the IPKF in Sri Lanka was to establish peace between the GOSL and the LTTE, the Indian forces engaged in several battles against the LTTE . The IPKF was withdrawn from Sri Lanka in 1990. India's support for the LTTE completely dropped after the assassination of the former prime minister Rajiv Gandhi in 1991 by an LTTE suicide bomber . Following the conditions on the Indo-Lanka accord, in 1987, Sri Lankan government passed the 13th amendment to the 1978 constitution. This amendment made "provisions for the establishment of a provincial council for each province....and to make Tamil an official language and English the link language." In 1988, the northern and eastern provinces were merged under one administration unit. Although the Indo-Lanka accord required a referendum to decide if the two provinces should be permanently merged, it was postponed by the GOSL . Three presidents took power in colombo during this period. President Ranasinghe Premadasa (1989-1993), President D.B. Wijetunge (1993-1994) and President Chandrika Bandaranaike Kumaratunge (1994-2005). Indian Prime Minister Rajiv Gandhi was assassinated in 1991. Sri Lankan President Ranasinghe Premadasa was assassinated by an LTTE suicide bomber in Colombo (1993) . The deployment of the IPKF was unsuccessful. President Premadasa (appeared to) made attempts to provide real political powers to the northeast province. In 1991, a committee comprising members from all parties was created to decide on devolution of power. the Sinhala and Muslim parties opposed the decision and the referendum was postponed again . 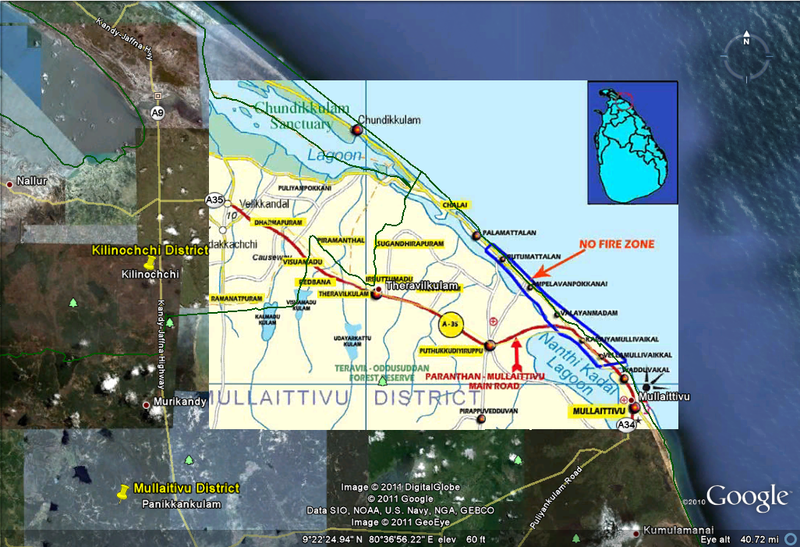 Figure 11: Google Earth Snapshot of the "No-fire zone" in the Mullaitvu district, a few miles to the sea side from the A-35 road. The area was declared as no fire zone in order to protect the civilians from war activities between the LTTE and the GOSL. The government is accused for shelling this "safe zone" and the LTTE is caused of using civilians as shields in the final stage of the battle. Prior to May 2009, this area was controlled by the LTTE (see Figure 4). The Sri Lankan army first took control of all Eastern province. Then, divisions 53, 55, 57-59 surrounded the northern province and by May 2009, the LTTE was forcibly moved to this northern corner of Sri Lanka. click on the image source for more details. 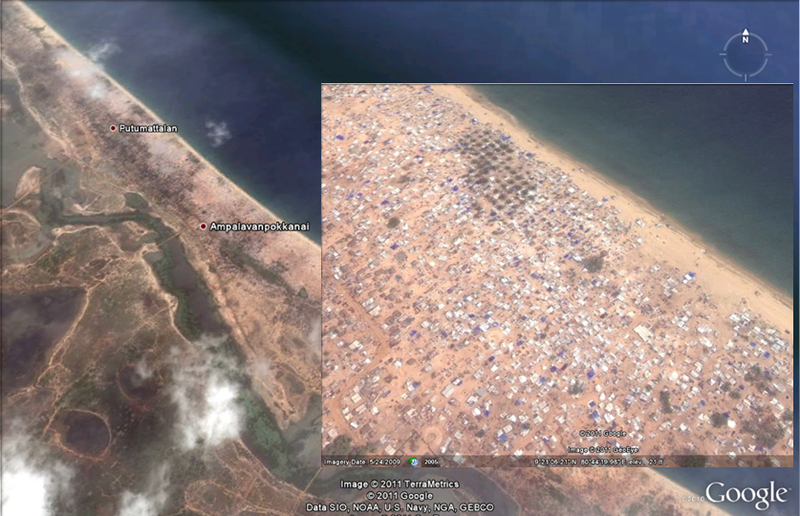 Figure 12: Zoomed Google Earth snapshot of the no-fire zone and the IDP shelters in the area. The blue and white colors are the roof tops of the IDP shelters. These refugees fled from the Northern war zones of Vanni and Killinochchi to this remote corner of on the North coast of Lanka during the final stages (2009) of civil war. The casual loop diagram above shows two sets of behaviors of climate change and civil conflict. The first set includes the predicted climate change impacts on North-East provinces of Sri Lanka. North-East region benefits from the NEM (North East Monsoon). Researchers have predicted high variability in rain fall with some predicting a decline in NEM and others predicting an increase in NEM, but relatively less in magnitude than rainfall during the southwest monsoon. Annual mean air and sea surface temperature in this region is expected to rise. The rate of rise in temperature for the country is 0.9-4 C by 2100. Sea level is also expected to rise, although the exact amount by which it will rise is not yet determined. Moreover, an increase in natural hazards such as floods cause by El Nino Southern Oscillation is predicted for this region. The second set of behaviors indicates how climate change impacts affect agriculture, water resources, tourism, and economic and social conditions in the region. For the simplicity of the diagram, the secondary effects from climate change, such as crop failure, soil water deficit, droughts, floods, schools and road closures, are not included. Instead, the final outputs from these secondary effects are shown in the diagram. An increase in NEM is a positive indication of a good harvest. As shown above, other climate change impacts negatively affect the livelihoods of people in this region. What really leads to conflict is; however, the inequitable distribution of disaster- relief aid. The aftermath of the Asian tsunami in 2004 and recent floods in early 2011 are good examples to prove this point . Inequity in relief aid can lead to tension between ethnic groups: Sinhala (country majority) and Tamil (Region majority) people, who are already in a tense relationship. Extreme events will lead to (push) migration of the inhabitants, most likely to Southern India and Colombo. In the aftermath of Black July incident, 30,000 Tamils migrated to India. These effects have the potential to create conditions for a civil war. It is also important to note the two way arrows to the right side of the diagram. Like seen in the aftermath of the Asian tsunami, the civil war had already created tension between the two ethnic groups, which then led to an in equity in relief aid distribution. The post-war situation in Sri Lanka is like a glass half full. Two stories; on one hand, the Sri Lankan government is employing several new development projects in the northeast (ex: Uthuru Vasanthaya). The fisheries industry in the area has resume its normal pace and once again, the country is a paradise in the eyes of tourists; both Southern Sinhalese and foreign tourists. In fact, in 2010 New York Times listed Sri Lanka as number 1 travel destination. Sri Lanka also placed number 1in Fox News' best performing market in 2010. While that is also true, minority groups in the northeast region are not convinced. The attraction of tourists to the previously isolated area has already begun to cause pollution in the area. Not only that, but the attraction of Sinhala tourists to the northeast to worship Buddhist temples that they could not visit for nearly 3 decades has also become a part of the Sinhalization of the country. In 2011, a report by the minority groups international stated that the northeast regions are still under control of the military forces and the people (mostly female) are in fear of physical and emotional abuses. The war has created over 89,000 widows in the northeast region. Regional and global: Although the civil war in Sri Lanka was fought against terrorism, there were enormous concerns on civilian casualties (mostly Tamil minorities) in the war zone. Thousands of people were killed, forced to migrate and/or sent to IDP camps. Many took refugee in IDP camps in Northwestern Sri Lanka or sought asylum in countries like India (South India), Australia and Canada. On a news article on May 22, 2010, the Ministry of Defense of Sri Lanka claimed Sri Lanka as the first country to eradicate terrorism. The impacts of the disastrous Asian tsunami of 2004 on Thailand's Muslim dominated fishing industry. The catastrophic event intensified the century-long ethnic conflict in Southern Thailand. In 2004, Niger faced drought & locusts that devastated agricultural production and intensified Niger’s food crisis, which led to ethnic conflicts between Niger farmers and Fulani herdsmen. Kaliman Indonesian government's "transmigration plan" that moved people from populated islands such as Java to less populated islands such as Kalimantan. Government's deforestation rights conflicted with local Dayak tribe's way of life. Zubair, L.; Hansen, J.; Chandimala, J.; Siraj, M.R.A. ; Siriwardhana, M.; Ariyaratne, K.; Bandara, I.; Bulathsinghala, H,; Abeyratne, T.; Samuel, T.D.M.A. 2005. Current Climate and Climate Change Assessments for Coconut and Tea Plantations in Sri Lanka. IRI, FECT, NRMS and UoP Contribution to AS12 Project Report to be submitted to START, Washington, DC., USA. Richardson, J. (2005). How Could We Have Come to This? In J. Richardson, Paradise Poisoned (pp. 11-38). Kandy: International Center for Ethnic Studies. Peebles, P. (2006). The History of Sri Lanka. Westport: Greenwood Press. Zubair, L., Ralapanawe, V., Tennakoon, U., Yahiya, Z., & Perera, R. (2006). Natural Disaster Risks in Sri Lanka: Mapping Hazzards and Risk Spots . In M. Arnold, R. S. Chen, U. Deichmann, M. Dilley, A. L. Lerner-Lam, R. E. Pullen, et al., Natural Disaster Hotspots: Case Studies (pp. 109-136). Washington D.C.: The World Bank. MRG. (2011). No War, No Peace: the Denial of Minority Rights and Justics in Sri Lanka. London : Minority Rights Group International.